The food court, formerly in two other office buildings that are part of the same complex, was entirely renovated and expanded. The primary objective of the food court renovation was to enhance the complex with a new significant tenant amenity in the southern downtown core. 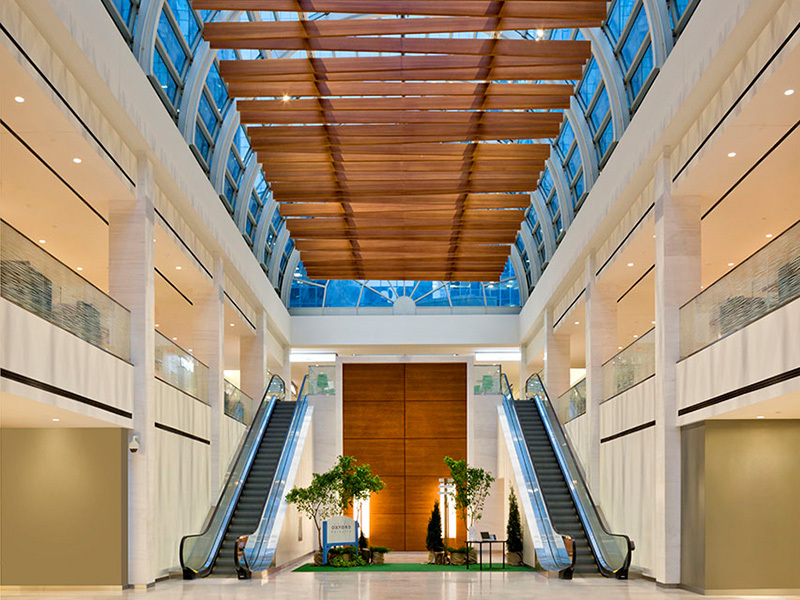 The dated architectural elements were replaced with clean lines, noble materials, and a brighter color palette elevating the property into the realm of a world-class corporate asset. Four distinctive zones create a journey of discovery with each having a connection to the other, therefore while each is unique, they all share common design elements linking them. The architectural shell, including the floor, wall and ceiling are treated similarly in all 4 zones, with a gradual transition of materials between each. The suspended irregular wood slats act as an intentional visual obstruction to block the 1980’s vaulted glass roof above.